Some of the "windows" of this cliff dwelling (ruin) are actually doors!! 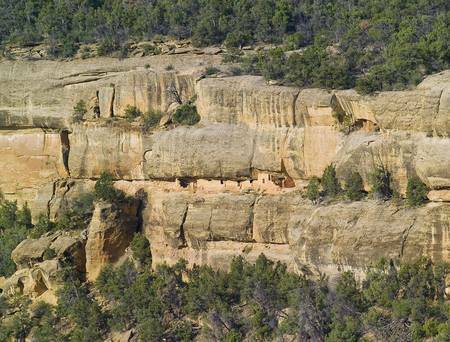 The Anasazi ("ancient ones") constructed 15 rooms on a 10 foot deep cliff alcove and used a toe-trail (literally a series of depressions in the rock used to gain traction) to climb to the mesa top (shown in this photograph) and the canyon. A toe-trail security feature is the necessity to start using the correct hand/foot combination, otherwise there will be a point from which it is impossible to proceed. There are 15 rooms here: a kiva, on the far left, a multi-story building, on the right, with 4 upper rooms and 10 ground floor spaces. They probably blocked the openings in cold weather to conserve heat. The Anasazi had gardens on the mesa top or the canyon, plus they hunted and gathered wild foods. In the gardens, they planted corn, bean, squash and watermelon in the rich soil. They also gathered wild plants and herbs such as bee-weed, ground cherry, milkweed, cattail, wolf berry and sedge grass Cliff dwelling alcoves include a seep spring, a seam in the rock through which a small amount of water flowed. Imagine the difficulty of hauling water every day if there was not a water source in the alcove. Can you find the unnamed ruin also in this canyon, we call it "Cliff Canyon"? These ruins are outside the national park boundary, inside the Ute Mountain Ute Indian Reservation.